Davis High School senior linebacker Jonzell Prudhomme was named the 2018 Northeast News’ Defensive Player of the Year. The future is indeed bright for Jonzell Prudhomme. The 6’2″, 220-pound senior linebacker turned in quite a year for the Davis Falcons. Prudhomme recorded 49 solo tackles, 37 assisted tackles, 18 tackles for loss, 11.5 quarterback sacks, 2 interceptions (one he returned for a touchdown), seven batted ball, five pass breakups and nine quarterback hurries. 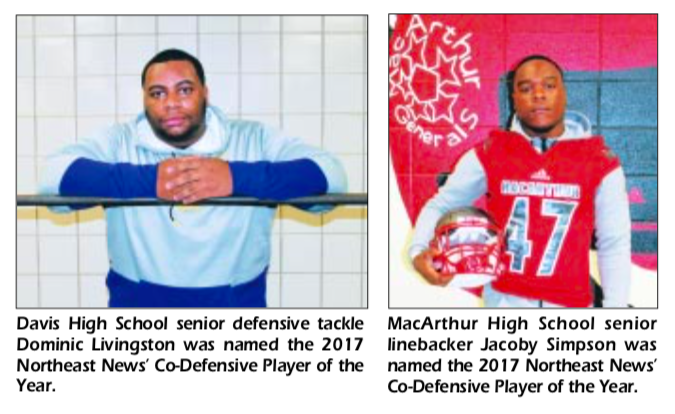 Those numbers added up to Prudhomme being named the 2018 Northeast News’ Defensive Player of the Year. He had a busy season indeed, and will also have a busy winter as he decides which college he wants to choose to continue his academic and athletic career. Prudhomme has already visited the Air Force Academy and will visit West Point in January. He is also drawing interest from Kansas State, New Mexico, Sam Houston State, the Naval Academy, Fresno State and a host of other schools. “I really liked the Air Force Academy and I am looking forward to visiting West Point,” Prudhomme said. James Showers, his coach, said whoever lands Prudhomme will be getting a special player. 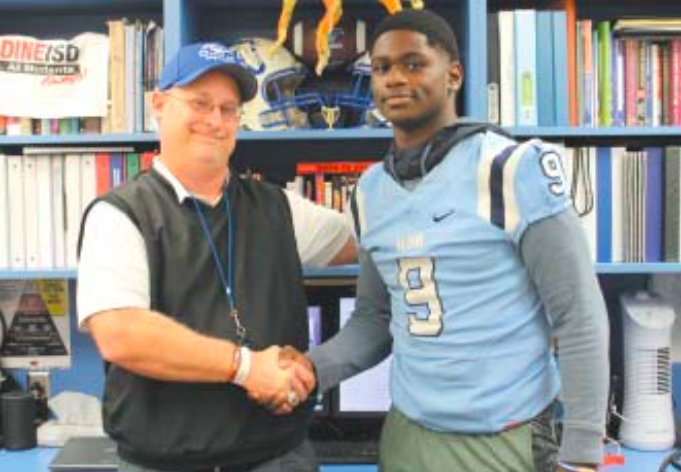 Head football coach Hank Semler congratulates Aldine High School running back Jacorey Howard after being named the 2018 Northeast News’ Offensive Player of the Year. It marked the second straight year that Howard won the award. He and former MacArthur High School star quarterback Odell James is the only other two-time NE News Offensive Player of the Year. Jacorey Howard had a season to remember in 2018. It was a tough one for the Aldine Mustangs, but the senior running back kept things interesting by rushing for 1,417 yards, averaging 6.6 yards per carry and scoring 13 touchdowns. He also added 101 passing yards for a total yardage on the season of 1,517 yards. Not bad for a kid who missed the last two games with a sprained ankle. For his effort, Howard was named the 2018 Northeast News’ Offensive Player of the Year. He also won the award after the 2017 season when he played quarterback for Hank Semler’s team. Howard and former MacArthur High School star quarterback Odell James are the only two-time winners of the award. On Dec. 19, Howard signed a national letter of intent with Texas Southern University. 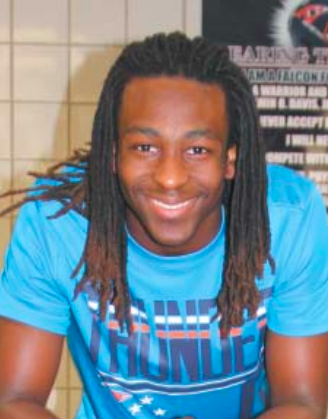 He also had offers from Rice, Lamar and Northern Iowa. “TSU has a great medical program and I want to be an occupational therapist,” Howard said of his decision to stay close to home to play his college ball. 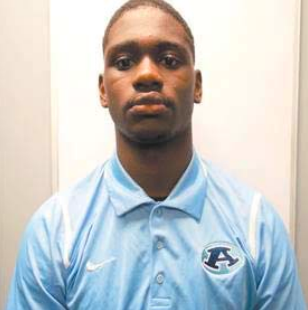 Aldine’s Jacorey Howard Honored as Week 3 Built Ford Tough Texas High School Football Players of the Week. Ford Motor Company announces the winners of the 2018 Built Ford Tough Texas High School Football Player of the Week trophy for week 3 – among these winners is Aldine’s Jacorey Howard. These six Built Ford Tough gridiron heroes are honored for their performance on the field and their leadership off the field. Each week of the regular high school football season will see a new winner in the sport’s six classifications, all with hopes of ultimately becoming the Built Ford Tough Texas High School Football Player of the Year. Labor Day weekend marks the unofficial end of summer and the official start of the football season. This weekend, high school stadiums across the state will be filled with screaming fans as they gather to watch their favorite teams begin their 2018 seasons. 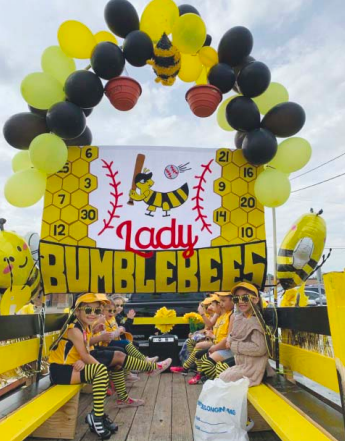 That will be the case in Aldine ISD where all five of the district’s varsity programs will begin their seasons with hopes of landing one of the four playoff spots up for grabs in District 16-6A. 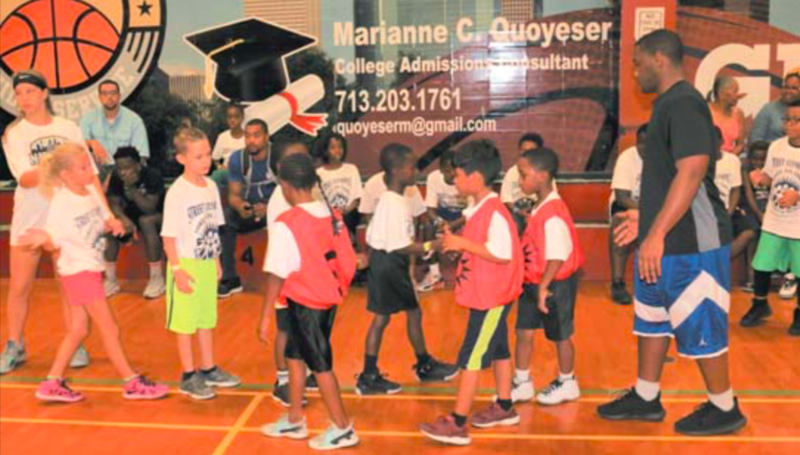 AISD has two new head coaches who will be making their debuts this weekend. 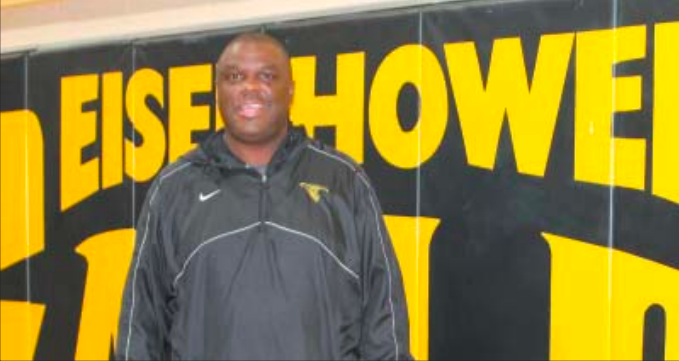 Eric Jackson is the new head coach at Eisenhower. He served as the team’s defensive coordinator prior to being named head coach last February. 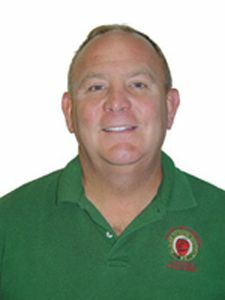 Wayne Crawford is the new head coach at MacArthur after serving as the Generals’ offensive coordinator. Crawford was also promoted last February. Both men are excited about their new positions and would like nothing more than to open their respective seasons with a victory. Labor Day weekend will also be the official kickoff for the 2018 NCAA season (four games were played last weekend), as fans will have plenty of intriguing games to watch in the first full weekend of competition. Welcome back football, we’ve missed you! The 2018 season is right around the corner and while baseball is still the talk of the town thanks to the Astros, football will always be king in these parts. Don’t get me wrong, I’m as big of an Astros fan as there is in this area, and am hopeful for another long playoff run in the fall, but injuries and a tepid offense has made things more difficult this time around. Heck, they may not even win their division. The Oakland A’s are breathing down their necks and are the hottest team in baseball. It would help to get Jose Altuve and George Springer back in the lineup (both are out with injuries) and get Carlos Correra’s bat going. But enough about baseball. It’s time to turn our attention to the 2018 football season and what story lines we will be following this year.